Carlos Martín Beristáin, miembros de la Comisión para el esclarecimiento de la Verdad, la Convivencia y la No Repetición, se reúne con la Mujeres de la Diáspora. The delegation was headed by Carlos Martín Beristáin, one of 11 members of the Truth Commission. They travelled to Europe to listen to the views of victims who were forced to flee Colombia throughout the five decades of armed conflict. The Commission has been established as part of commitments made in the 2016 peace agreement between the Government of Colombia and the Revolutionary Armed Forces of Colombia (FARC). The experience of Diaspora Woman is very valuable for the Truth Commission…our task is to strengthen existing initiatives like this one. The Commission has been set up to explore the grave violations of human rights and international humanitarian law throughout the armed conflict. After a six month inception period, the Commission will have three years to identify the impact of violence on society, the responsibilities during the war, the cause of the conflict and the reasons for its continuation; and to recommend policies to acknowledge and address the rights of the victims. This visit is an impressive achievement for us: over the past three years we have been working hard and now that the Truth Commission has been established we are acknowledged as agents of change, as we are well prepared to contribute with our knowledge. This is the culmination of a process of empowerment of the women in the diaspora. The purpose of Diaspora Woman is to empower victims of armed conflict and other migrants living abroad to become catalysts for peaceful change in Colombia and for increased integration in their host countries, through an innovative process of psychosocial healing. The women hope to continue to support the work of the Commission during its three years of operation. Over the last few decades, millions of men and women, many direct victims of the war, have left Colombia in search of a better future. Others migrated primarily to study, work or maintain personal relationships; but even in those cases, armed conflict permeates their life experience. The decision of the Colombian Truth Commission to engage with the diaspora is unprecedented. In the past only the Liberian Truth Commission took a similar interest in diaspora communities. To find out more about the work of Diaspora Woman read our report about their achievements. This initiative empowers women in the diaspora to become agents of change in the Colombian peace process and in their host countries. Conciliation Resources works to support women of the Colombian diaspora to share their stories, memories and hopes and to claim a place and a voice in the county's peace process. Watch to find out more. 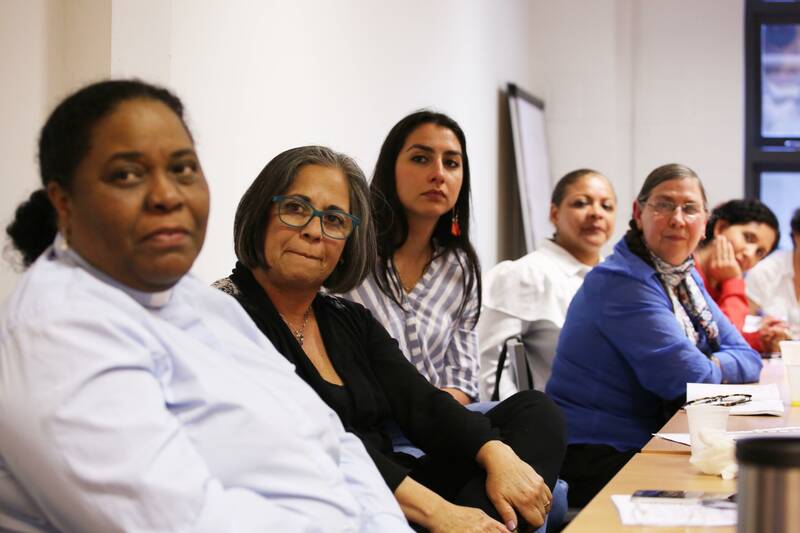 After three years of work, the Truth Memory and Reconciliation Commission of Colombian women in diaspora present the achievements of their efforts, and recommendations to Colombian and international policy-makers.